Should Adidas really sell Reebok? So it seems like an easy question on first glance. Bought for $3.8 billion dollars in 2005-6 and rumoured to be currently valued at $2.2 billion it seems clear that on face value the company Reebok has lost money and needs to be severed. Well I don’t think it is that simple. Reebok is an interesting brand one that has truly been one of the most changed and re-moulded sports brand of the last decade. Around 20-30 years ago Reebok began it’s popularity with the emergence of Aerobics and as they grew they moved into main stream sports such as basketball and while in real money terms they weren’t the same, Reebok and Nike owned it and together with Adidas they owned the streets with every child having a least one pair of the trainers. However Reebok slowly lost out to Nike in part due to the ‘air’ range and as time went by we began to forget about this once giant. The nail in the coffin, being when they lost the deal to make American Football shirts for the NFL. Adidas buy them and something begins to change slowly but surely. Initially Reebok was to help Adidas get deeper into the American market but as time has gone by it seems, at least for me, the branding and the positioning of Reebok has changed to stand for something a bit different. It has edge and it is underground or conforms to sports that for many would seem to be on the edge of society through their extreme nature. 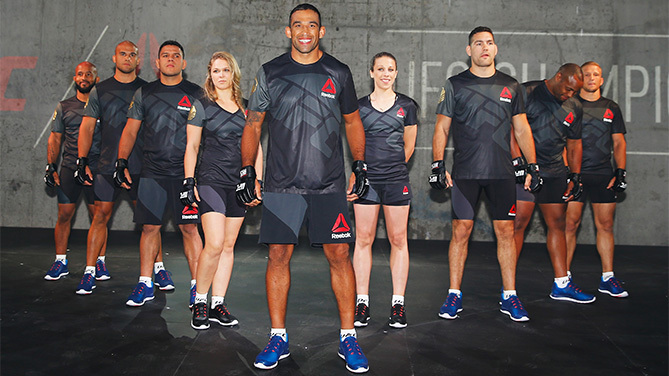 Reebok is a household name and brand leader in UFC and CrossFit, two sports that are growing hugely in popularity. They have remoulded themselves into one of the strongest brands and are growing, with reports from Adidas books showing Reebok has been growing for the last 5 quarters. They have used a model similar to RedBull; through association marketing with growing brands they become the go to brand of that particular sport. And while there are the new upstarts of brands such as Under Armour I believe Reebok looks bright and Adidas would be unwise to lose such a growing edgy brand from their portfolio. If they do sell then the risk to Reebok is that the new owners will become slightly weary about where Reebok currently is and start to bring it back more into the mainstream. This I feel will be a mistake as it is the very extremeness of the brand which is making it popular.